What is the evidence that there are mass graves at the Treblinka death camp? Technology shows that the soil of Treblinka exhibits no evidence of disturbance. Detectable disturbance would have occurred if Treblinka was a death camp with large mass graves. This claim made by Holocaust deniers is false. There is photographic evidence, as well as postwar forensic evidence, proving the existence of the mass graves. Krege claims that he used Ground Penetrating Radar (GPR) to investigate the Belzec and Treblinka death camps in 1999–2000. A GPR device, as Krege supposedly used, looks like a lawnmower. When it is pushed or dragged across the surface of the ground, it maps the structure of the soil underneath. To map the soil underneath, it utilizes sound waves and displays the results on a computer screen. Krege claims that the GPR is so sensitive that even the mark of a shovel pushed into the soil would be revealed. Before Treblinka was abandoned in November 1943, the camp buildings had been bulldozed down to their foundations and covered with sand. The mass graves had been dug up, the remains cremated, and the pits refilled and re-covered. On top of that, local Poles peppered the ground with holes as they dug in the dirt, searching for valuables that had belonged to the murdered Jews. There are also images of Treblinka from 1945 that clearly show the disturbed ground and human bones scattered around, due to the “wildcat digs” conducted by the local Poles. The images show an area that looks like a “moonscape,” full of holes, bones, upturned soil/ash “saturated with white shards that are obviously bone fragments,” and at least one very large pit. If Krege’s GPR device was so sensitive that it could find a shovel mark in the ground, how did he miss the overwhelming evidence of the destroyed camp? How did he miss the well-documented digging conducted by the locals? The Polish State Prosecutor’s Office and the Main Commission for the Investigation of the German Murders in Poland examined the Treblinka site in November 1945. In their final report they noted that they found several graves, the largest of which was 6 meters deep (about 20 feet). In the largest pit: “. . . Numerous human remains were found by these excavations, partially still in a state of decomposition. The soil consists of ashes interspersed with sand . . . During the excavations, the soil gave off an intense odor of burning and decay.” The sand covering an area of about 20,000 square meters or about 215,278 square feet was mixed with human ashes, turning it gray and granular. How did Krege miss the bone chips and ash in the sand, which could still be found on the surface of the soil, visible even without GPR technology? Krege and his denier friends had to sneak around to do their “research” with the GPR device, as they did not have permission from the museum authorities at Treblinka. However, forensic archeologist Caroline Sturdy Colls conducted a 2010 study with permission from the museum authorities. With this permission, she was able to do her study in a scientific manner, rather than sneaking around and doing only piecemeal research. Using the same GPR device Krege allegedly used, Colls has preliminarily identified “a number of buried pits” that are “considerable in size, and very deep, one in particular is 26 by 17 meters [85 by 58 feet].” Colls noted that: “Another five pits of varying sizes and also at least this deep” are located near the large pit. “Given their size and location, there is a strong case for arguing that they represent burial areas.” Colls has published work related to her research at Treblinka and the public has taken notice. In 2001, Krege’s findings were presented in an article in the Journal of Historical Review, published by the Institute for Historical Review, an American Holocaust denial organization. Krege announced at that time that his findings were to be published in book form, but, as of 2014, there have been no further articles or books on the matter. Not even Carlo Mattogno, an Italian Holocaust denier who funded Krege’s research and accompanied him to the site, has been willing to publicly endorse Krege’s spurious findings in the intervening years. Krege spoke at Holocaust denier conferences in Washington, D.C. in 2001 and Moscow in 2002. Although he is described as a “sought after lecturer on Treblinka” by his supporters, his only other notable recent appearance was at the 2006 Iranian Holocaust denial conference in Tehran. 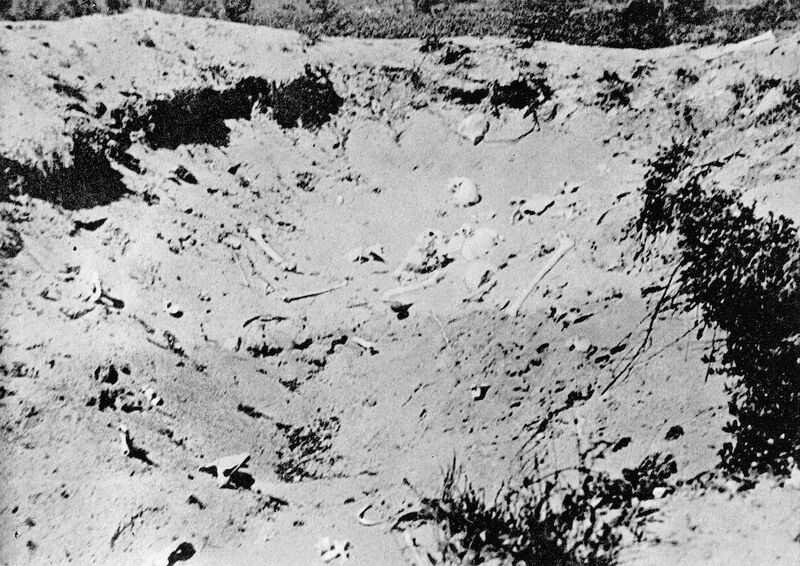 Krege’s assertion, that the soil at Treblinka was undisturbed, is false. There is photographic evidence regarding the state of the site after the closing of the camp. This evidence shows the area riddled with holes, heaps of sand, and deep pits. These images also reveal bones and human remains, which could be seen with the naked eye. Aside from these documented disturbances of the Treblinka soil, the Polish State Prosecutor’s Office and the Main Commission for the Investigation of the German Murders in Poland proved the existence of mass graves at Treblinka in November 1945. They too found human ashes and remains. In 2010, an authorized study using a GPR device has located a number of very deep and very wide burial pits. “Treblinka Ground Radar Examination Finds No Trace of Mass Graves” at http://www.ihr.org/jhr/v19/v19n3p20_radar.html. Richard Krege, “The 1999 Krege Report on the Treblinka Extermination Camp” at http://barnesreview.org/wp/archives/280. Rachel Auerbach in Alexander Donat, editor, The Death Camp: Treblinka: A Documentary (Holocaust Library, 1979), pp. 69-71. You may see pictures of the camp site from 1945 that clearly show the piles of sand and the human remains of the Jews murdered at Treblinka uncovered by the treasure hunters at http://holocaustcontroversies.blogspot.com/2011/12/belzec-sobibor-treblinka-holocaust_5940.html. These images and more are available in the archives of the Ghetto Fighters’ House Museum in Israel at http://gfh.org.il/eng/. “Belzec, Sobibor, Treblinka. Holocaust Denial and Operation Reinhard. Chapter 7: Mass Graves (2). Number, Dimensions and contents of the Mass Graves” at http://holocaustcontroversies.blogspot.com/2011/12/belzec-sobibor-treblinka-holocaust_5940.html. For more information see http://holocaustcontroversies.blogspot.com/2008/03/gold-rush-in-treblinka.html. “Protokol czynnosci wykomanych w terenie w toku dochodzenia sadowego w sprawie obozu smierci w Treblince, AIPN NTN 69” as cited in “Belzec, Sobibor, Treblinka. Holocaust Denial and Operation Reinhard. Chapter 7: Mass Graves (2). Number, Dimensions and contents of the Mass Graves” at http://holocaustcontroversies.blogspot.com/2011/12/belzec-sobibor-treblinka-holocaust_5940.html. Martin Gilbert, The Holocaust: A History of the Jews of Europe during the Second World War (Holt, Rinehart and Winston, 1985), preface, p. 17. See David Irving’s website, http://www.fpp.co.uk/Auschwitz/Treblinka/IHRJ191000.html citing “Treblinka Ground Radar Examination Finds No Trace of Mass Graves,” Journal of Historical Review, 19(3) (May/June 2000). “Was Treblinka a Death Camp?” at http://holocaustdenial.com/Zyklon_B/judicial_inc_biz/Treblinka.html. “Iran Hosts Anti-Semitic Hatefest in Tehran” at http://archive.adl.org/main_International_Affairs/iran_holocaust_conference.htm?Multi_page_sections=sHeading_3.